For the last several days, Space Shuttle Discovery has been preparing for one final flight. Tomorrow, weather permitting, Discovery will make the trip from Florida's Kennedy Space Center to the Smithsonian's National Air and Space Museum's Steven F. Udvar-Hazy Center in Chantilly, VA from atop a repurposed Boeing 747 jet airliner — an airliner aptly named the Shuttle Carrier Aircraft (SCA). NASA photographers have been snapping tons of photos of the entire mounting procedure, from the arrival of the SCA at Kennedy Space Center last Tuesday, all the way up until this morning, when Discovery, fully mounted atop the SCA, backed out of the apparatus NASA used to safely secure the shuttle. Here are a few of our favorite pictures. All captions by NASA unless otherwise indicated. Do yourself a favor and click the images for the hi-res versions (2000x3000). This overhead view shows Shuttle Carrier Aircraft parked on the apron of the runway at the Shuttle Landing Facility at NASA's Kennedy Space Center in Florida. The aircraft, known as an SCA, arrived at 5:35 p.m. EDT [April 10, 2012] to prepare for shuttle Discovery's ferry flight to the Washington Dulles International Airport in Sterling, Va., on April 17. This SCA, designated NASA 905, is a modified Boeing 747 jet airliner, originally manufactured for commercial use. One of two SCAs employed over the course of the Space Shuttle Program, NASA 905 is assigned to the remaining ferry missions, delivering the shuttles to their permanent public display sites. The newly arrived Shuttle Carrier Aircraft is seen through the platforms of the mate-demate device at the Shuttle Landing Facility at NASA's Kennedy Space Center in Florida. Here you see Discovery in the enormous Vertical Assembly Building. Behind her is the largest door in the world. It is 456 feet tall and takes 45 minutes to open. Space shuttle Discovery rolls out of the Vehicle Assembly Building, or VAB, at NASA's Kennedy Space Center in Florida, into darkness for its trip to the Shuttle Landing Facility, or SLF. Its move got under way at 5 a.m. EDT [April 14, 2012]. Discovery was in storage in the VAB's high bay 4 awaiting departure from Kennedy's Launch Complex 39 area for the final time. At the SLF, Discovery will be hoisted onto a Shuttle Carrier Aircraft, or SCA, with the aid of a mate-demate device. Space Shuttle Discovery's move from the Vehicle Assembly Building to the Shuttle Landing Facility, or SLF, is complete as the day breaks over NASA's Kennedy Space Center in Florida [on April 15, 2012]. Preparations are under way at the the mate-demate device, or MDD, at the Shuttle Landing Facility at NASA's Kennedy Space Center in Florida to lift space shuttle Discovery atop a Shuttle Carrier Aircraft, or SCA. The MDD is a large gantry-like steel structure used to hoist a shuttle off the ground and position it onto the back of an SCA. At the Shuttle Landing Facility at NASA's Kennedy Space Center in Florida, a crane attached to the sling supporting space shuttle Discovery lifts the shuttle inside the mate-demate device during operations to position Discovery on top of a Shuttle Carrier Aircraft. At the Shuttle Landing Facility at NASA's Kennedy Space Center in Florida, the Shuttle Carrier Aircraft is positioned beneath space shuttle Discovery in the mate-demate device. Discovery will be lowered and mated to the aircraft in preparation for its departure from Kennedy on Tuesday. The device, known as the MDD, is a large gantry-like steel structure used to hoist a shuttle off the ground and position it onto the back of the aircraft, or SCA. 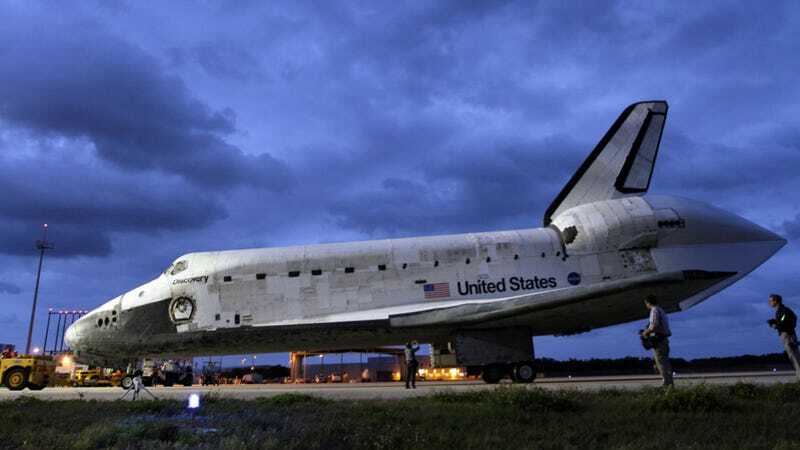 At the Shuttle Landing Facility at NASA's Kennedy Space Center in Florida, initial mating of space shuttle Discovery and the Shuttle Carrier Aircraft is complete in the mate-demate device. Known as the "soft mate" [suggesting the attachment has been made but has yet to be finalized], the procedure was complete at about 11:15 a.m. EDT. As the sun rises [on April 16, 2012], preparations are under way for the Shuttle Carrier Aircraft carrying space shuttle Discovery to back out of the Shuttle Landing Facility's mate-demate device at NASA's Kennedy Space Center in Florida. CAPE CANAVERAL, Fla. – The Shuttle Carrier Aircraft carrying space shuttle Discovery backs out of the Shuttle Landing Facility's mate-demate device at NASA's Kennedy Space Center in Florida. At the Shuttle Landing Facility at NASA's Kennedy Space Center in Florida, the Shuttle Carrier Aircraft with space shuttle Discovery secured to its back is parked on the tarmac awaiting departure from Kennedy [the morning of April 17, 2012]. Remember: this is just a small sampling of an extensive collection of images captured by photographers Kim Shiflett, Tim Jacobs and Dimitri Gerondidakis, and others, all available in jaw-dropping hi-res quality through NASA's photostream and Kennedy Space Center Media Gallery. As of this posting, the latter is still updating on a fairly regular, real-time basis, but they are both definitely worth checking out.